BTW: Notice how the one on the right has a rounded case? Any ideas where that came from? The rounded front case is correct. The later "squared-edge" case is from a 65 up unit and will interchange so often found on rebuilts. The rear cases will not interchange as the brush system is different. We are looking at a correct pulley repop. These would be used on Cobras and 427 Galaxies/Mercury's. Would they sell if the cost $79-99.00? The cost of tooling and the small volume will limit the market and require amortization over a much smaller sales base than say a repop part for a Mustang. jolsen42, ALF and AndrewB like this. If you can do this I am in. I'd think they'd sell for twice that at least if accurate, especially considering the value of an original. Larry, what are you efen nuts? Don't give Rick any ideas, just kidding, but you are probably correct, I would pay that, but would prefer the lower price! Well as of now I am halfway through the first batch of fifty pigtails! If we can do fifty of the pulleys I think we might pull the trigger! I have some contacts in the Galaxie world and there is some interest there which will help make it possible. I will keep everyone posted as to the progress. jolsen42 and AndrewB like this. Thank you for for the info -- much appreciated. The guy I bought them from had only one round case and a few squared off ones so thankfully I snagged the round one as well. Any tips on finding a rebuild kit? I'm in for two for sure, possibly three. I agree that you might be selling yourself a bit low on the price . I was hatching a plan myself until I received the alternators and realized the fan and pulley were one piece. I just want to say thank you again to Rick and Larry/Jeff for taking on these projects. You all are doing some very impressive work! If we can do fifty of the pulleys I think we might pull the trigger! I have some contacts in the Galaxie world and there is some interest there which will help make it possible. From my point of view (having looked at too many originals to begin to count since circa 1971) you would have two similar but different versions to be 100% correct for most Mercury/Ford sedans with one model and a second for most CSX2201 and later Cobras. The sheave outer diameter of the two are different, the black paint is a little different, font used for the engineering number is different, and where the yellow inspection paint daub location is different. Oh yeah, there was a service version without an engineering number stamped in (I have one.) and a version with prototype style markings (a forum member had one). Dearborn Steel Tube made (more likely had made by a subcontractor) replacement sheave and fan assemblies for nearly three decades in small numbers and the ones I held in my hands at their booth at a show were slightly different than either the Ford sedan and Cobra ones. My advice is to know what market you are after, decide if it is worth going for day one accuracy, and use a for sure genuine production original to copy. Related comments. If somebody commercially does the sheave and fans that leaves only the COBRA lettered fan belt unavailable alternator wise. 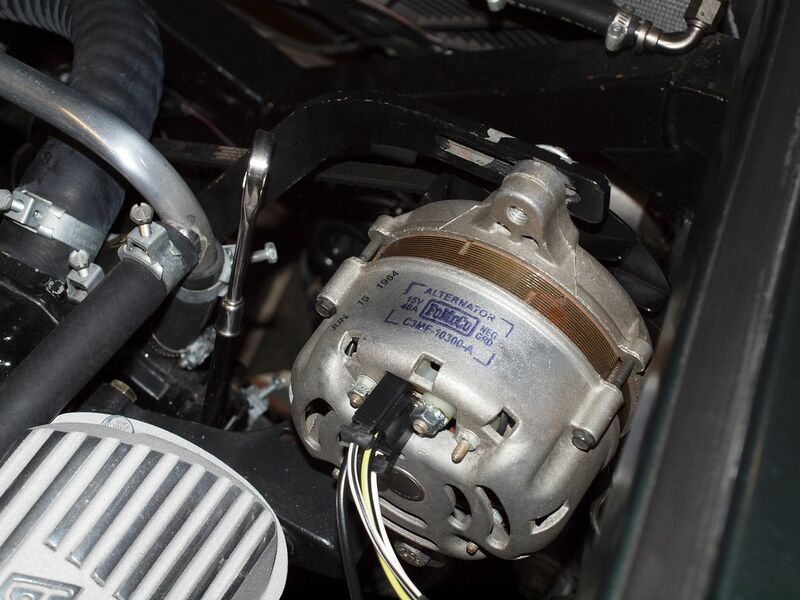 Alternator mounts and adjustment arms are sold commercially by a forum member. AMK Products® has the special length Ford specification bolt and thick hardened flat washer used for the adjustment slide. COBRA lettered fan belts for CSX2201 and later cars have been made by several restorations shops for cars they have done but I don’t think any of them sell them commercially. To have complete coverage they would have to have stamps to do several different manufacturing dates. We've looked at doing the belt lettering and will probably pursue that when needed. The process we would do is to silk screen the belts. Something I've seen from time to time on original and replica Cobras using the DST alt pulley is the wrong width belt. Correct if I'm wrong Dan but the original belt is .390" wide I believe. It fits in the pulley nicely as well as the correct vintage water pump and crankshaft pulley. A wider belt rides higher in the pulley and runs the risk of coming out. Just something to keep in mind. Original belts are narrow ones. They were tough as I know of original cars still using them five decades later. Tossing belts is usually an indication that one of the engine sheaves is the wrong one. The CSX2201 and later Cobra system was designed around 1963 Ford 260/289 sheaves for crankshaft and water pump applications. 1963-64 engines use the same parts. Starting roughly August 1964 the new “1965 model” engines got new sheaves with different groove locations relative to the mounting hubs. See Bob Mannel’s book. Mixing 1965 sheaves with a CSX2201 alternator system will most likely lead to fan belt issues. When I bought my red car somebody had installed 1965 and later water pump sheave. The alignment with the original alternator and crankshaft sheave were quite visibly off and the belt had to be super tight to keep it from walking off the incorrect sheave. Super tight fan belts are not a good idea. The purchase of a good used 1963-64 water pump sheave solved that problem. The original white ink stamping (yes, rubber stamp method) was very fragile. Time, fluid leaks, careless handling, pressure washing, or chemical cleaning all removed the text. Original belts are not ultra rare but ones with text that you can read are. Production and service parts were dated. The latest date I know of for a service part was in the fall of 1966. Restorers have no problem getting stamps made but finding high performance, narrow width, and unmarked belts is not just an any parts store search. For belts I suggest contacting Kevin Marti at Marti Auto Works. He does the "FoMoCo" stamped/dated belts for many Ford applications and used to make them for my business. He had/has a source for the correct width and does what I assume is a hot stamp process that embeds the text into the belt surface. I had him make about twenty different belt applications for 61-66 Thunderbirds and the belt cores were genuine Motorcraft belts so no worries about belt quality. And I neglected to post the pricing information on the plug/harness setup....they are $47.95 each and shipping via USPS Priority is $7.50 for up to 5 plugs. I will talk to the potential pulley manufacturer this week. A pile 'o packages stuffed with these harnesses went out this AM. I would appreciate comments on them when they arrive. The front and rear bearings are commonly available at any parts store or bearing supply house. Do be sure to get a decent brand as some very cheap, Chinese bearings are out there and they don't like RPM! The brushes are tougher, I do have some NOS Autolite sets and am working on a supply that we may have found from an old time rebuilder. I will post when/if they are available. Rick, alternator harness's arrived today and they are beautifully done. Thanks so much. Now on to the Fan/pulley. Got my alternator plug today. Very nice piece. Nice picture....me likey very much! Glad you guys are happy with the outcome. We are trying to provide quality parts at a real world price. 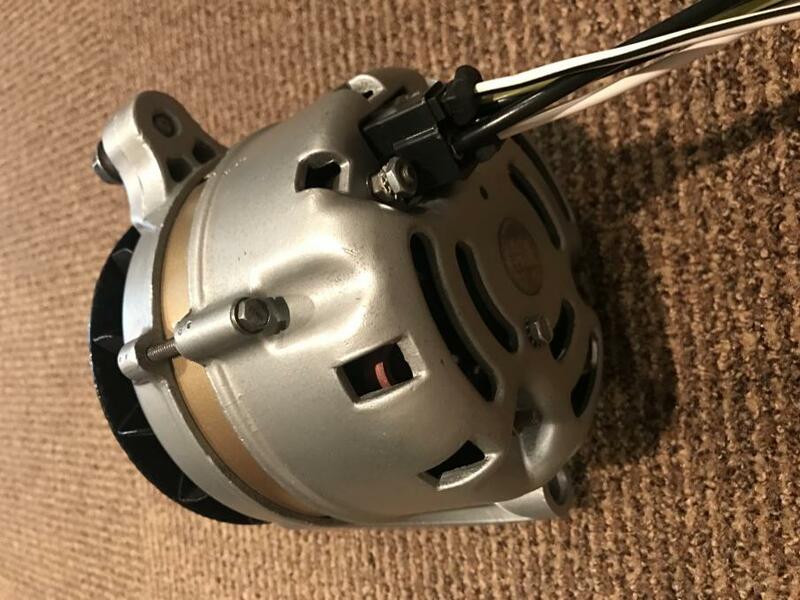 I had some previously made plugs for another application, that retailed (with more of the harness on them) for $125.00 and was offered $300.00 for my last one. I knew we could do better. The harnesses came in yesterday and they look fantastic. Thanks again! Here is a pic of my alternator with new correct plug and stamp. Thanks Rick and Larry. Last edited by jolsen42; 05-12-2017 at 03:14 PM..